While most people are stocking up their pantries with Chinese New Year tidbits and goodies, I’m stocking up mine with an assortment of nuts and seeds. After my recent visits to Victoria Wholesale Centre and Albert Centre Wholesale Market, I’m now into this (go) nuts shopping frenzy that I’m sure any chipmunk or squirrel would love to sneak into my pantry cupboard, lol. 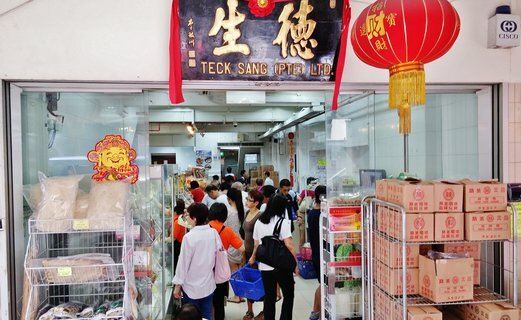 I was recently recommended to check out Teck Sang which is an importer/exporter and wholesaler of traditional Chinese food stuffs, dried goods, spices, herbs, marine products and canned products with a retail outlet for walk-in purchases at Hong Kong Street. 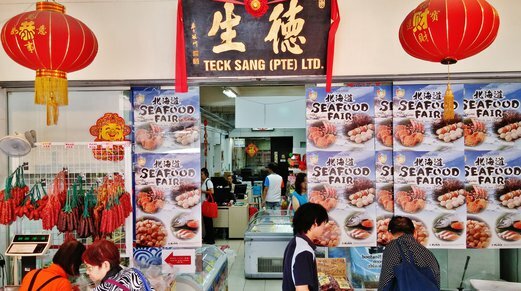 Teck Sang occupies two units of shop space. The unit on the right houses mainly frozen & chilled seafood, dried scallops, canned products, etc. 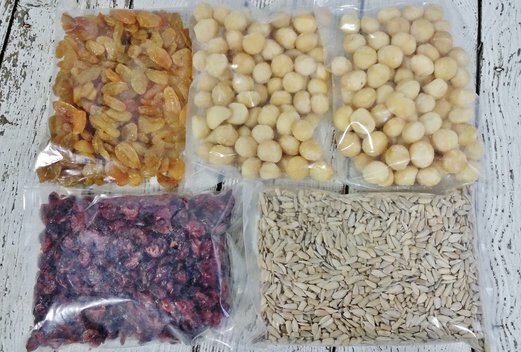 While the unit on the left covers traditional Chinese food products (like green beans, red beans, raw peanuts, etc), dried products (like mushrooms, fungus, shrimps, etc), and dried fruits, nuts and seeds. It was pretty crowded when I was there on Saturday noon. The section I was interested in was just this. The dried fruits, nuts and seeds are all stored in see-through containers in a chiller fridge with their prices (per kg) clearly stated on labels. We can sample the items before purchasing which is a plus point so we can compare the taste or quality between similar items of different origins (for example there are two types of macadamia nuts – Australian & South American – at same prices). Just need to let the shopkeeper know the quantity you want and she will scoop and weigh accordingly. Everything is sold by weight here. And here’s what I bought – USA Jumbo Raisins at $8/kg, Australian Macadamia Nuts at $36/kg, Dried Cranberries at $15/kg and Sunflower Seeds at $6/kg. I highly recommend the raisins that are huge & juicy and the macadamias that are so fresh and nutty sweet. For this Chinese New Year season, they will be open on weekends (Sat & Sun) from 8.30am to 5.30pm. Go wholesale nuts shopping! Hi, of the three (VWC, Albert, Teck sang), which is the most value for money? Thanks! Hi, between Albert and VWC, I would say go for Albert as prices there seem to be cheaper for the same quality products. As for Teck Sang, prices might seem slightly higher but it’s because the quality and origin of the nuts are different – for eg. macadamias are imported from Australia and for that, I think Teck Sang offers value-for-money nuts compared to retail shops. Cheers! The level of hygiene and environmental conditions in Albert may be a concern though; as it is not air-conditioned, mould may grow more easily? Nuts and seeds would also turn rancid more quickly. The presence of a hawker centre downstairs may mean more rodents as well.. Have you compared prices in Mustafa? They sell nuts and seeds, dried fruits etc for pretty good prices as well, so it would be good to compare them with Albert/Teck Sang! I would suggest storing nuts and seeds in the fridge so you can keep them for longer if you intend to buy in bulk or are not able to finish them within a short period of time. I don’t see why mould would grow easily because it’s a non-air conditioned place because their products are kept dry and fresh. Turn over is high so there are always fresh batches of goods for sale which is the most important for dried goods stores. So far I have no issues with the products I bought from different shops there. But if you do buy from an air-conditioned shop (Teck Sang stores their nuts in chillers), then obviously you’d have to store the items in the fridge too when you bring them home because its the moisture that will cause the nuts to become mouldy. I have seen the nuts at Mustafa but I’d rather buy from Albert because I could sample them before making my purchase. And because there can be several grades to each type of nut, you can try them out and decide which one you like. It is more flexible to buy by weight so we don’t have to end up buying a fixed amount for a certain type of nut. You should go check out these places personally and see which one fits your needs best. Good luck! Thanks! Would be great if there are places that sell organic nuts, seeds, dried fruits at wholesale prices too – a pity these places don’t carry organic items! 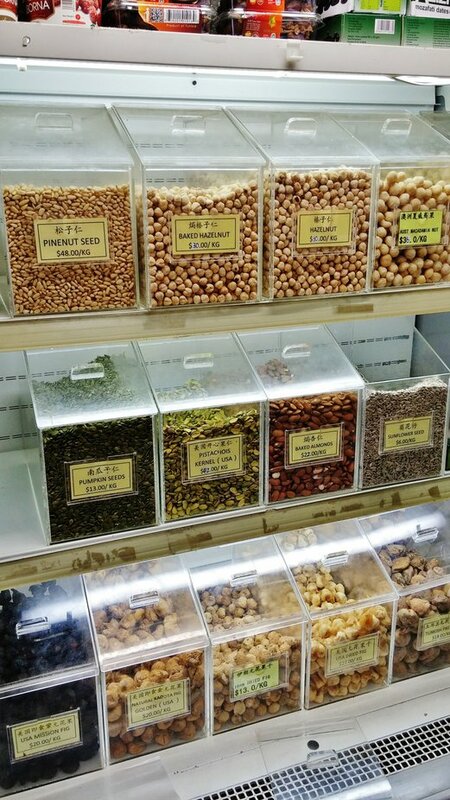 There are some shops at Pasir Panjang Wholesale Centre that sell organic nuts and seeds. Been there a while back but didn’t buy any because I’m not into organic products so you might want to go check it out one day. Hey Geri Tan, I am really curious why they won’t sell me 100g of nuts now? It is a compulsory to purchase a minimum of 300g and that is absurd. I like to buy nuts and mix it myself but 300g minimum weigh will not allow me to buy more variety because of the cost. (I’m on a budget). When I was there the last time, I recalled they did have this min. 300g purchase policy but only for certain products. If you’re thinking of getting smaller amounts, try the wholesale market at Albert Complex instead where you can purchase assorted nuts in 100g (also cheaper if you buy more). Teck Sang now allows for you to mix and match your 300g of nuts or dried fruit into a single pack, that really helps with the selection. What a pleasant surprise! I was searching online for cheaper fruits and nuts and found your blog. Definitely will head down to Albert Park soon to buy the seeds as I am doing home bake bread every day for my family. The seeds in NTUC are ex as you said. Wonder if you know of any good wholesale price for fruits – fresh as the local supermarkets are expensive if one is to have fruits daily. I am now into juicing and would like to have abundant supply economically. Hi Desmond, you can check out the Pasir Panjang Wholesale Market for fresh fruits and vegetables. The more you buy, the cheaper the price so it’s good if you need a bulk supply for your daily juicing. Cheers. Where did you purchase the nuts in the end? 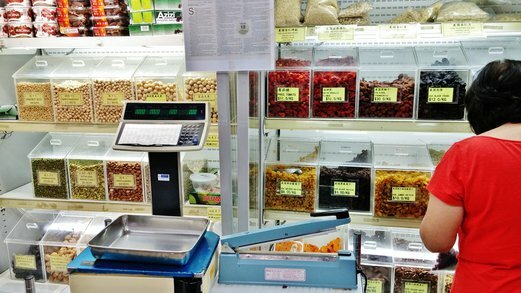 Any nice experience with other nuts wholesalers beside Teck Sang/Albert Complex? I just visited Teck Sang this afternoon (22 Nov 2016) after reading posts on your blog on this same day. I eat sunflower seeds regularly as a snack and I was quite surprised to seed that the sunflower seed on display has gone up 30% in price. It is now $8.00 per kilo when your posting in Feb 2015 said that it was $6.00. Nevertheless, I took a close look at the seeds and I came away not too impressed as the seeds looked rather stale and dried. Looks like this is my first and last visit to this shop. That’s really a big jump in price. Thanks for sharing. I haven’t been there for a long while. Been buying sunflower seeds from Mustafa Centre instead as they come in smaller packs. You might want to check that out. Cheers. so now in 2018, where is the cheapest for dried stuff? I wouldn’t say there’s a cheapest place as the prices depend on product origin and quality. Depending on what you are looking for, recommended places to explore would be Albert Centre Wholesale Market, Mustafa Centre, Lao Ban Niang (this is my current favourite) and Emperor Brand.